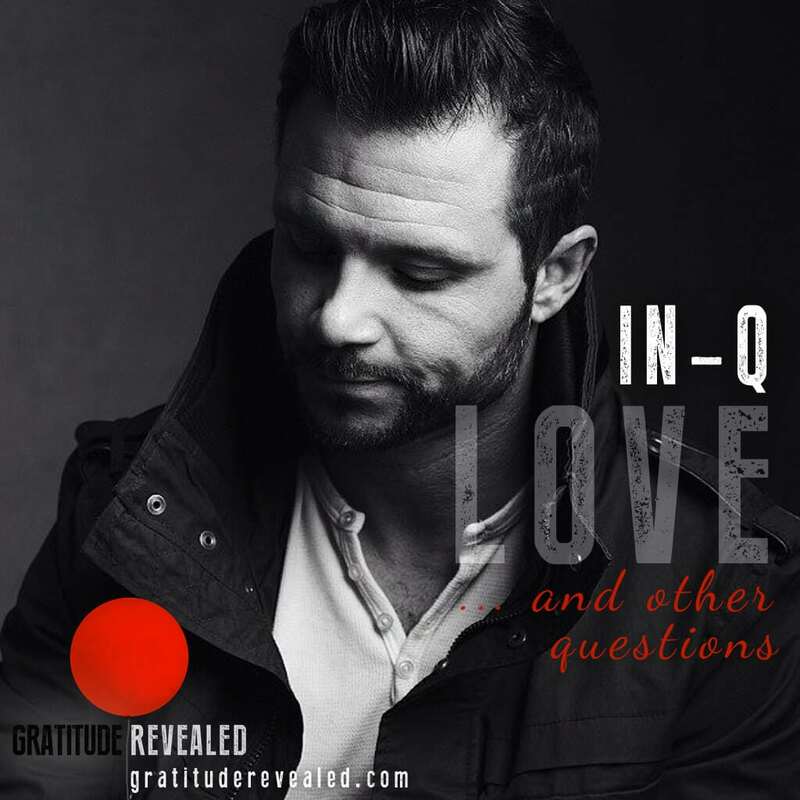 IN-Q, which stands for In Question, uses his talent with words to inspire audiences to question what they know about the human experience. We are honored to feature his love poem, Eighty-Five, he wrote for our Gratitude Revealed short film on the subject. GR grabbed a precious sit down with the artist to ask him some very personal questions on love and what makes the world go round. If so inspired, we invite you to learn more here. GR: How do you approach a topic as broad as LOVE and end up with such a specific vision of this 85-year-old couple? Can you talk about that creative journey? IN-Q: With any subject that I tackle, I always start with something that’s true to me, and then the poem will kind of write itself… as long as I give it the space and time for the creative process to happen. In this particular case, I was living in a back house a few years back and the woman who owned the main house had her mom move in with her who was in her 80’s. She and I became really close friends and we would have coffee every morning before I would go to the studio. We would talk about life and love and the pursuit of happiness. I would complain to her about my ex-girlfriends and whatever else was going on. We became very close and I came to love her. Then one evening I woke up in the middle of the night and she was getting taken away by an ambulance on a stretcher. She was still alive, but she was going through a lot of health complications. I ended up visiting her in the hospital and she had tubes running in and out of her body, a really high fever and she didn’t recognize me. I sat with her and I said my goodbyes because I thought that this was her time… but it wasn’t. She fought back and got better and they moved her into a retirement community. I went and visited her, and she ended up telling me she’d met a guy in the retirement community and they’d fallen in love. IN-Q: I thought that was such a beautiful story, and when I started to write “85″, I didn’t even really realize that it was inspired by that. I just had that line, “I want to fall in love at 85.” Then as I got into the piece I realized that it was directly inspired by Dolores’ story. You know, you always try to start with something that’s inspiring to you if you want to inspire other people. GR: That is amazing. That’s beautiful. I’m so struck by this wonderful dichotomy that you bring between this undercurrent of edginess in your rhythmic poetry, and then what can only be described as the most intimate vulnerability of pure, openhearted LOVE. Do you ever find yourself having considerations or second thoughts about being so vulnerable with your subject matter? IN-Q: Yeah, of course. If you’re vulnerable you open yourself up for judgment. I don’t know who said this, and it really doesn’t even matter anymore, because who said anything? I mean, we all said it and nobody said it, simultaneously… Anyway, the quote is something like, “If you don’t want to be criticized, do nothing, say nothing and be nothing.” [The quote is often attributed to Aristotle, but actually writer Elbert Hubbard, from his book John North Willys, wrote “Do nothing, say nothing, and be nothing, and you’ll never be criticized.”] So sure, people are going to judge my work as an artist, but that’s certainly no reason to live a smaller life, and hopefully that’s outweighed by the people that are inspired and challenged and entertained by it. I have a sense of whether it’s valuable to me, and that’s the most important thing, and I have the assumption that if it’s valuable to me then it will be valuable to other people. GR: So, with your mission to inspire audiences to question what they know about the human experience, is there something you are hoping that a person might question about love? IN-Q: Everything, nothing, you know … I think the world would be a better place if people stop accepting the reality that’s been given to them. If they question who they are and what their place is in the world individually, and if we do that collectively, I think that’s how the human species is going to evolve. I think what creates empathy is when we question things about ourselves and then share our stories and realize that we’re more alike than we might initially think we are when we’re passing each other on the street or living in a different area or from a different cultural background. We’re all human and we all want the same things, and ultimately I think it does come down to love. I just want to mirror what my experience is back onto the world. I don’t need anyone to do anything based on that, nor do I even think I’m right, nor do I even know what that means. I just, at this point, have this philosophy about my own life and I like exploring it through my writing and I hope that sparks people. GR: It seems like it’s a process for you of questioning with no need for an answer, just exploring the process and people can take it or leave it as they wish. GR: So, we’re publishing this post on New Year’s Eve, and I was curious about your thoughts around this magical idea, this myth of having that one perfect kiss right at midnight. What do you think about that and how it ties into our conversation about love? IN-Q: Sounds good to me. GR: Do you have a plan for the perfect kiss at midnight? IN-Q: My perfect kiss is in Dubai right now. My girlfriend is in Dubai attending a wedding, but you know … I don’t need New Year’s to be anything. I’ve never felt that kind of pressure to have one kind of New Years Eve. This year, for example, during the holidays, I decided I wanted to be really focused and disciplined about what I put into my body and being healthy, and there’s something really beautiful about choosing to be disciplined during a time when most people are letting go. It becomes more intentional, so for me this year I’m being very clear on what I want to create in my life and what I want to create in the world, internally and externally, and I want to use New Year’s to be very intentional about that. So instead of going out and partying, I’m probably going to be focused on what I want to create in the world, so I don’t need it to be anything. GR: Sounds like you have a lot of respect – and love – for yourself right now. IN-Q: Yeah, that’s true. If you want to have love in your life, just focus on being the best version of yourself that you can be and your frequency will change and you’ll attract someone else who’s doing the same thing and then you can build from a place that’s complete other than from a place of need.